The Mississippi Delta is losing land. Here's why. It's not just a story about sea-level rise. 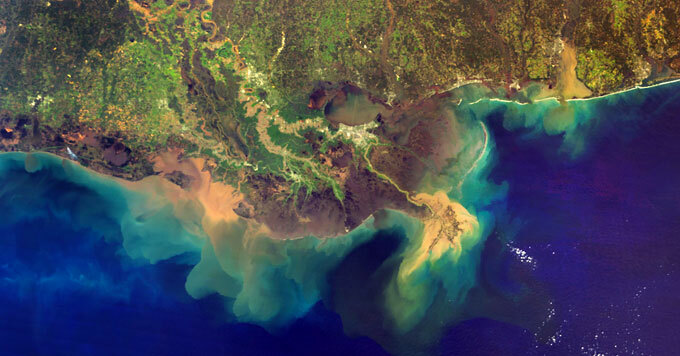 Mississippi River Delta and sediment plume (Credit: NASA). More than two million people live in southeastern Louisiana in what’s known as the Mississippi River Delta. Elizabeth Chamberlain researched this process as a doctoral student at Tulane University. In the area of the Delta she studied, sediment helped build two to three square miles of land each year over a thousand years. But today, the Delta is losing land, not gaining it. One reason is that levees, while they help prevent floods, also prevent new sediment from replenishing areas of the Delta that are eroding and sinking over time. And with climate change, the problem will get worse. But she says there are ways to minimize the loss of land. Diverting water from the river can bring new sediment to depleted areas, helping sustain the delta and the communities that depend on it.